Graduating very high in the Galaxy Police Academy, Kiyone Makibi had the unenviable burden of being Mihoshi's partner. It seemed that the blonde's bumbling and bungling had put a unexpected curve in Kiyone's career path, as promotion after promotion had passed her way. That's why it was a relief for Kiyone that Mihoshi had been reported dead pursuing the space pirate Ryoko. To her, the albatross around her neck that was Mihoshi was finally gone and she could advance in her career happily... OR SO SHE THOUGHT!! Kiyone had learned later from headquarters that a destress signal had been picked up on a small planet called Earth... a signal that belonged to Mihoshi, and she was ordered to investigate. Hoping against hope, Kiyone, onboard her ship Yagami, had traveled to Earth, where not only (to her disappointment) Mihoshi living in Tenchi's house, but also the Juraian princesses Ayeka and Sasami... AND RYOKO!! Almost imedietly, Kiyone fought the space pirate (after lunch, that is) and captured her (with a little help from Ayeka). But just as she was reading Ryoko her rights, Mihoshi (who had joined the battle in a mecha suit but lost control very quickly), crashed into the two, ruining everything. Kiyone was so happy. It had been a month since her partner Mihoshi had been declared missing in action (and she presumed killed in action). The greatest threat to her career appeared gone forever...until she got the call. Word was that Mihoshi may be alive on Earth. She hoped for her future happiness that it wasn't true. It was true. Her nightmares have returned...with a vengeance. At first, though, she thought she could put a feather in her cap (and possibly get promoted out of this perdicament) by capturing Ryoko, who happened to be living with the rest of the gang. With Ayeka's help, she had her, but then Mihoshi ruins everything. To top that off, she finds out that she and Mihoshi have just become the sector's resident officers, meaning they would have to live together...on Earth. Thus the Miho-Kiyo team (a term Washu cooked up) was going to be together for a while. 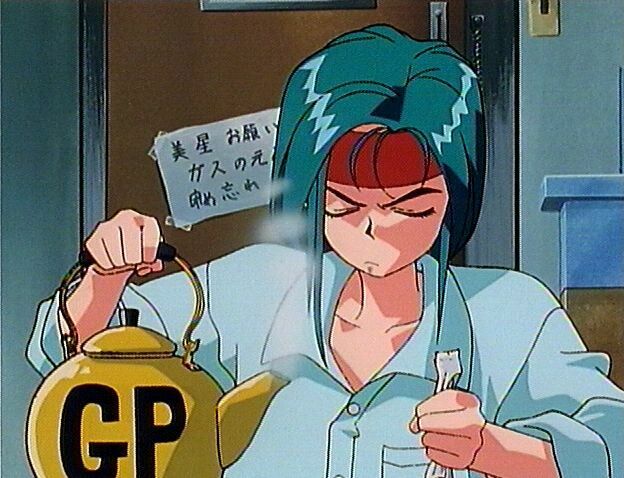 Probably the only other true victim in this cast other than Tenchi, Kiyone still performs the duties of a Galaxy Police officer as prescribed. However, she harbors one great wish: GET ME OUTTA HERE! The above description came from Who Wants to Know?, and was edited by yours truly (contact me). The image came from Elwin Blaine Coldiron.